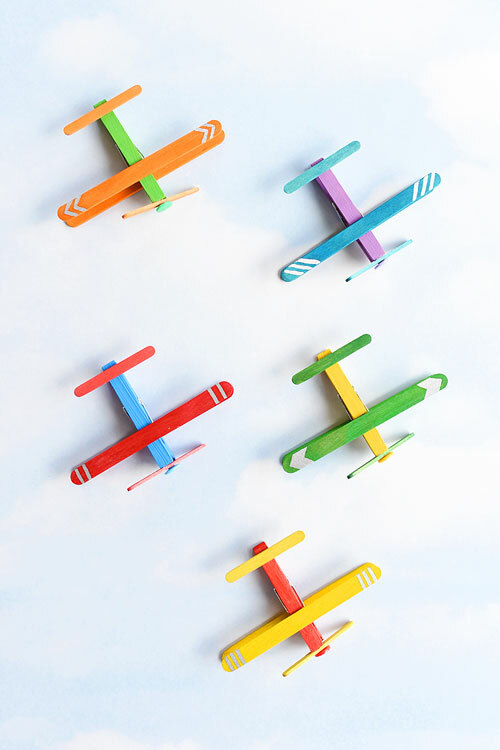 These clothespin airplanes are adorable. Seriously, they make me smile. 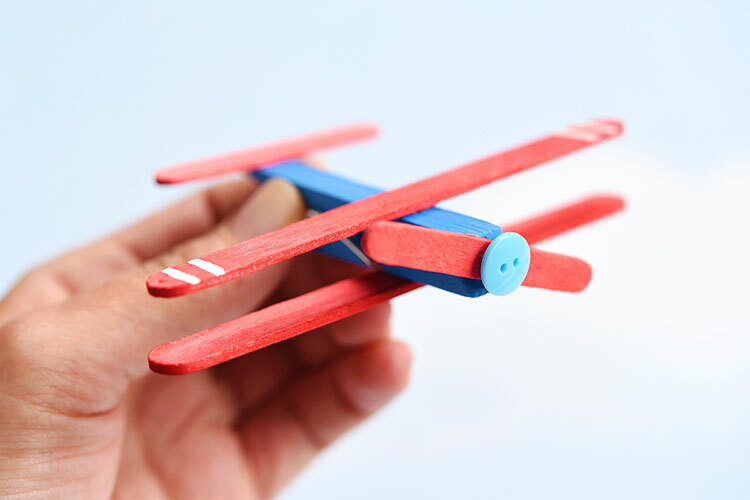 I love how simple they are to make and how they actually look like airplanes. 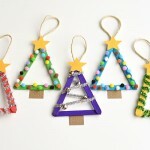 From just popsicle sticks and clothespins!? My husband said I should hang the airplanes from fishing line and make a mobile. I didn’t… but that would be a super cute idea too! I love that he was excited about these airplanes! We make lots of crafts around here, but he seems to only get excited about the stereotypical boy projects (go figure!). There’s a chapter in my new book, Low Mess Crafts for Kids, that’s all about vehicles on the road, and let me tell you, he LOVED when I worked on that chapter! He still plays with the paper roll cars, the tissue box fire truck and the wheelie police cars we made. Lots of fun! See more about the book here. 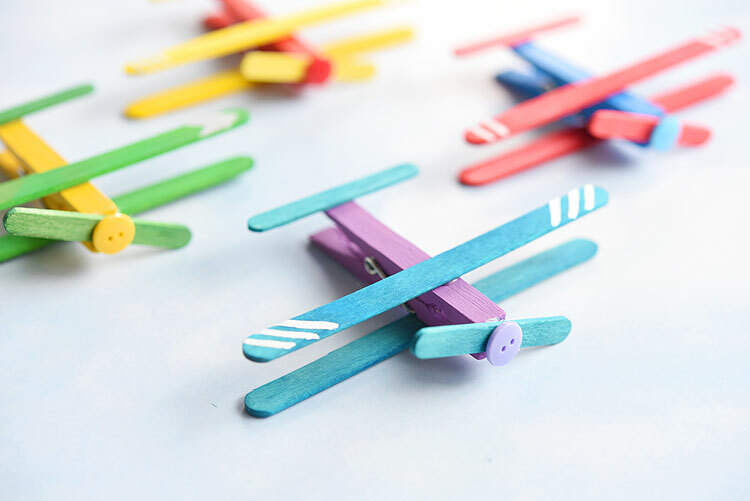 My 6 year old daughter took the purple airplane and started pinching the clothespin open and closed to make it talk. Ha! I love how creative kids are with these things! I got my coloured craft sticks from the dollar store – both the regular sized ones and the mini ones. 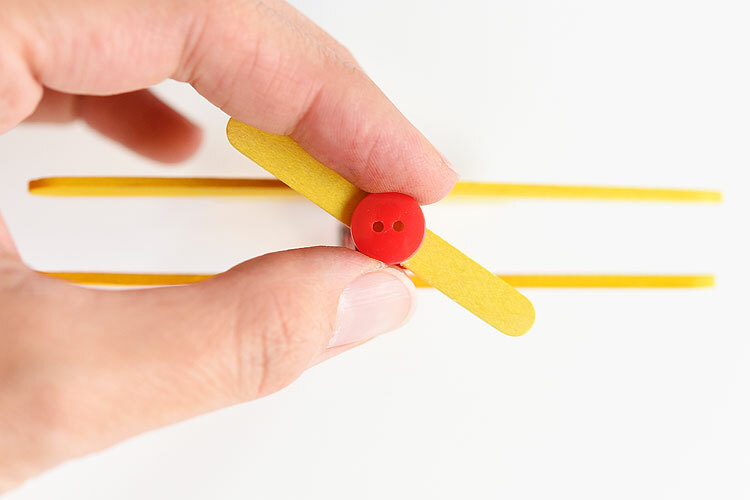 It’s one of the first times I’ve seen the mini craft sticks, and I love them! They’re about half the size of a normal popsicle stick. Carefully remove the metal spring from the clothespins. 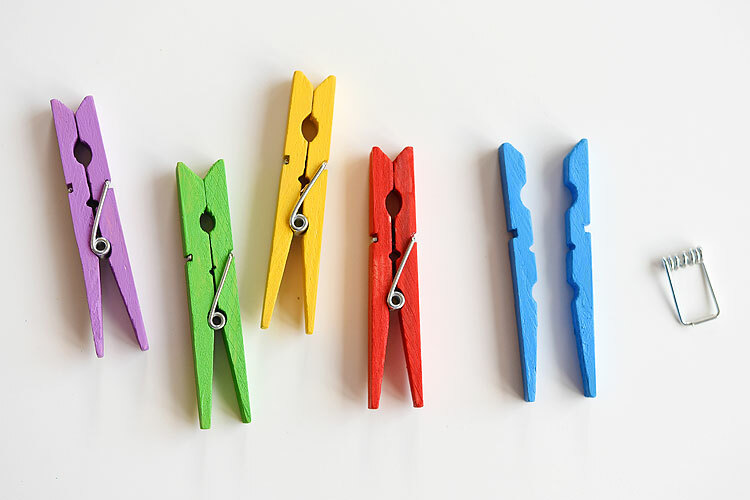 Paint each of the clothespins, then set them out to dry. I like to paint on a foil lined baking sheet because it’s super easy to clean up. I squeeze the paint on a disposable plate and when I’m done I can just throw the plate and the foil away. The clean up is so easy! 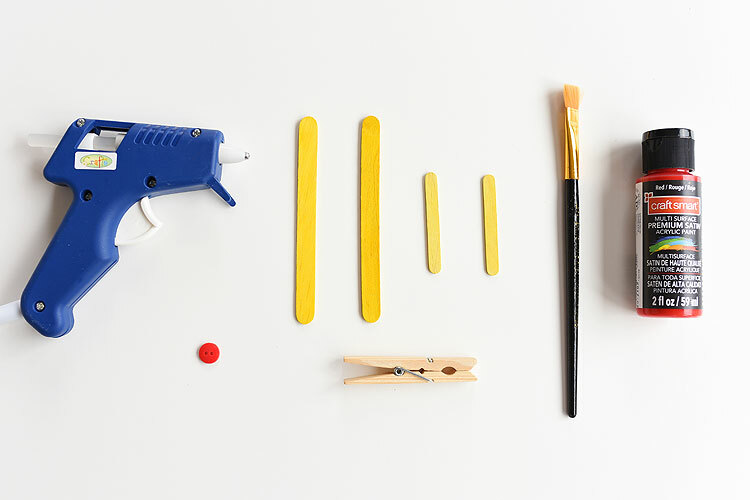 Once the paint is dry, try to get the spring back onto the clothespins. 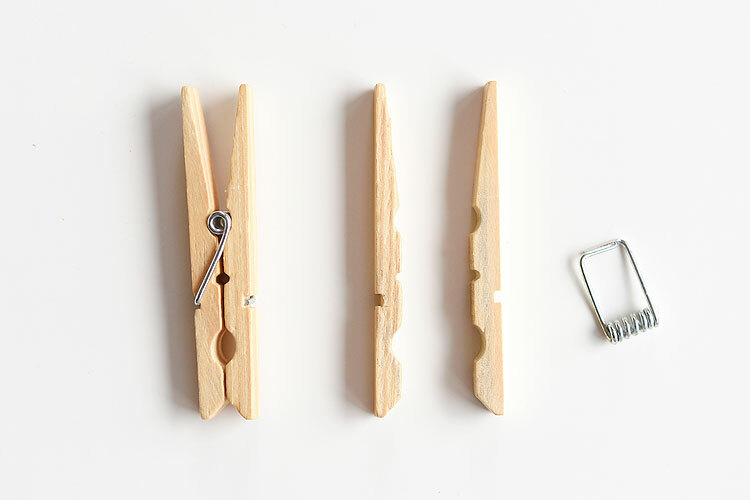 I used dollar store clothespins, so they’re really easy to take apart and put back together. 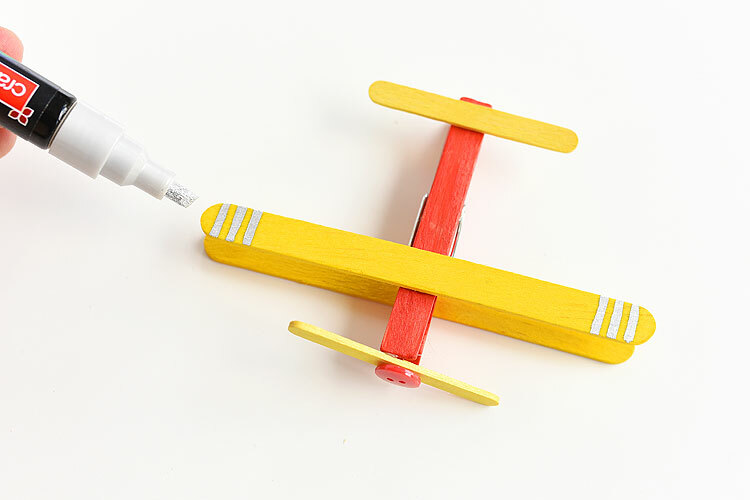 Glue two regular popsicle sticks to the top and bottom of the clothespin to make the plane’s wings. 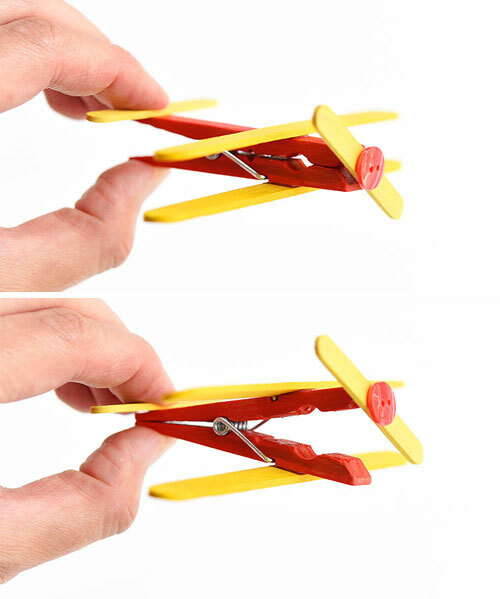 Then glue one mini clothespin to the top/back of the clothespin for the plane’s tail. 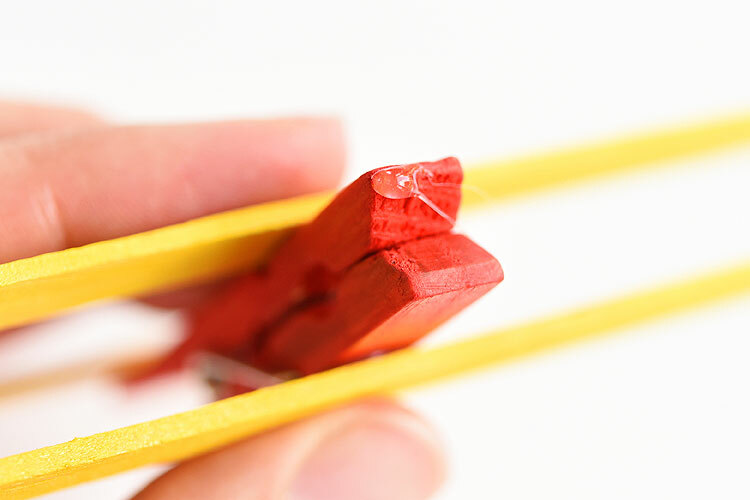 Try not to get glue right on top of the clothespin spring, otherwise the clothespin won’t open. You can use whatever glue you like for this. 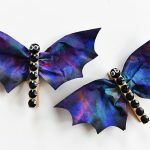 I like using a glue gun because it’s super fast, but white glue would work just as well. You’d just need to give it some time to dry. I really wanted these airplanes to open and close when you pinch the clothespins. 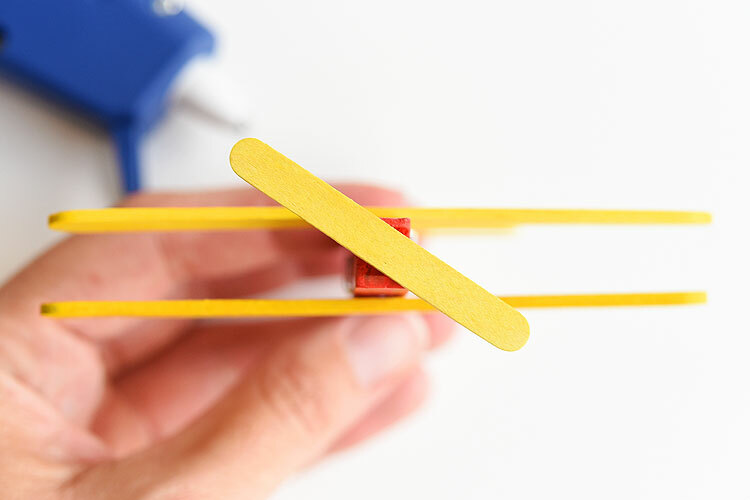 In order to make that happen, you have to glue the front propeller onto just the top part of the clothespin, exactly where my glob of glue is shown in the photo below. 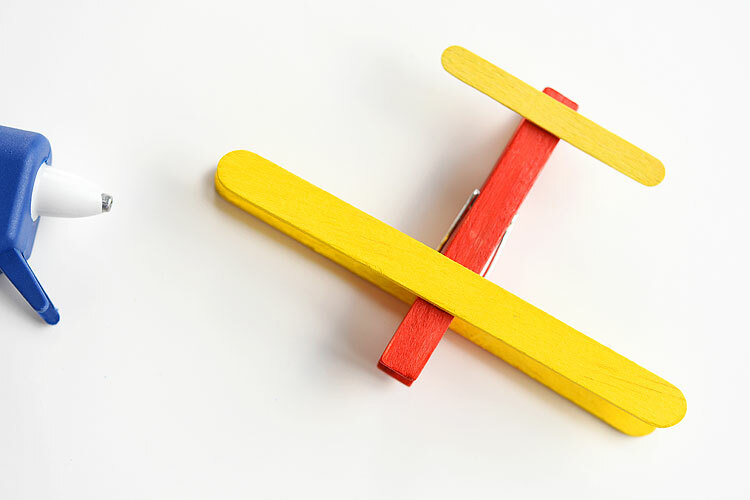 Then attach another mini popsicle stick onto the glue, on a bit of an angle to make the propeller. Finally, glue the button to the middle of the propeller. I was thinking it would be fun to clip the airplanes onto things. But my kids took the airplanes and pinched the clothespins opened and closed to make the airplanes talk. And then they asked why I didn’t add googly eyes. haha Maybe next time?! This next step is completely optional. I thought the airplanes looked a little plain, so I decided to add some simple designs to the wings using a silver paint pen. I love all the bright colours together! 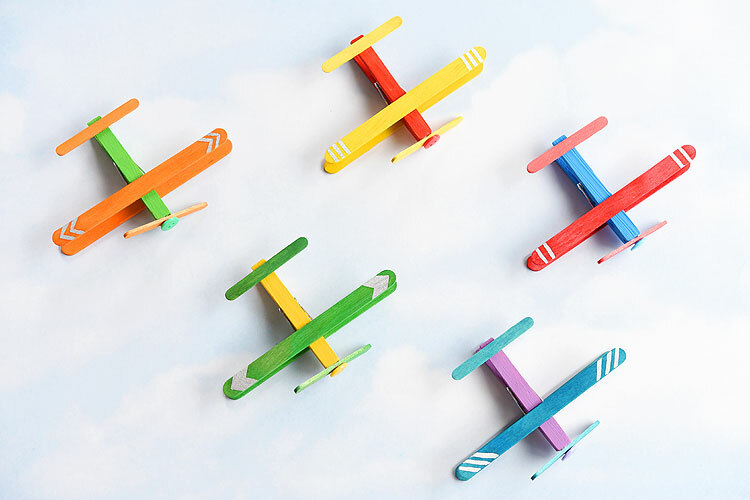 It’s so easy to make your own little fleet of airplanes! 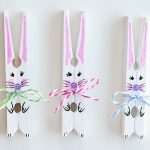 These clothespin airplanes are SO CUTE and they’re really easy to make using clothespins and craft sticks (popsicle sticks). 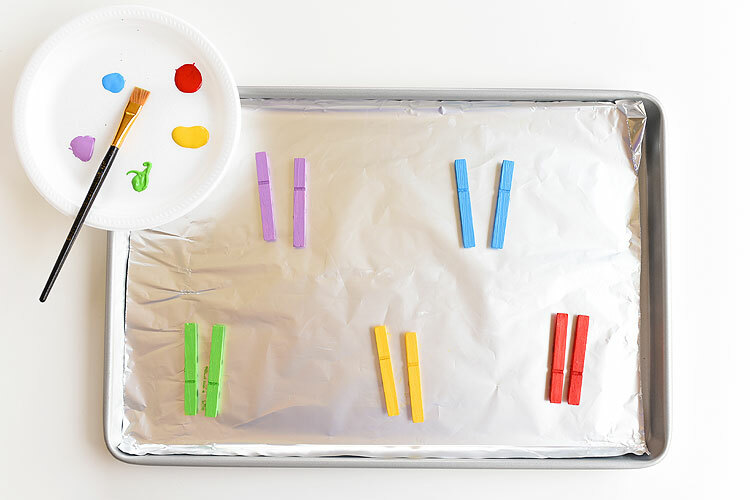 This is such a fun kids craft and a great craft for a rainy day! 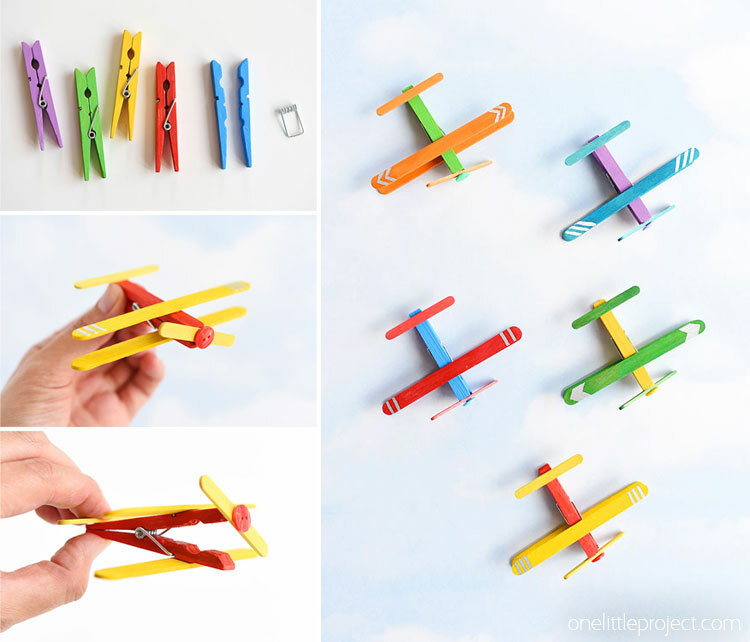 They look like real airplanes and the clothespins even open and close! 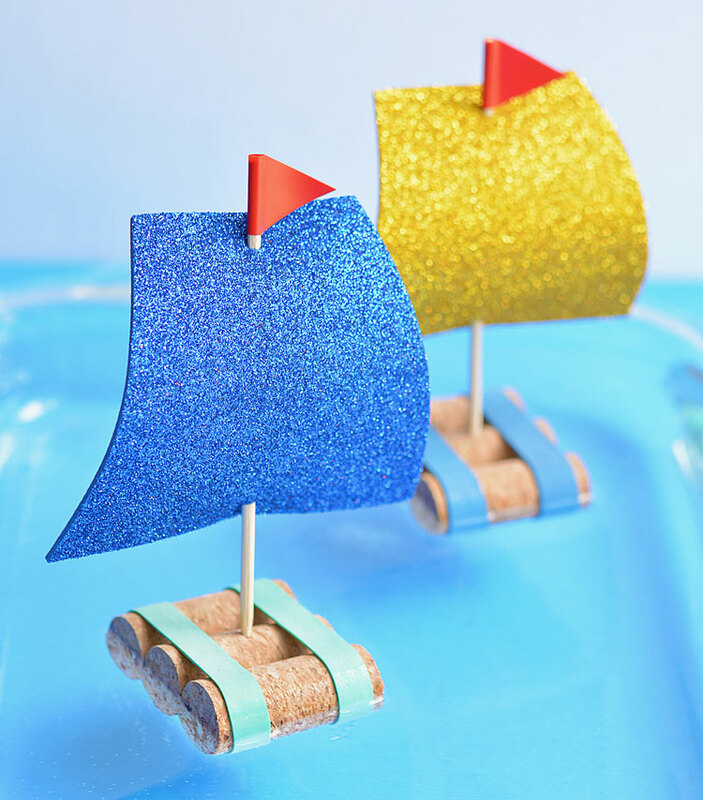 If you’re looking for more fun crafts, be sure to check out our short video for how to make wine cork sail boats. These are so cute and they actually float on water! 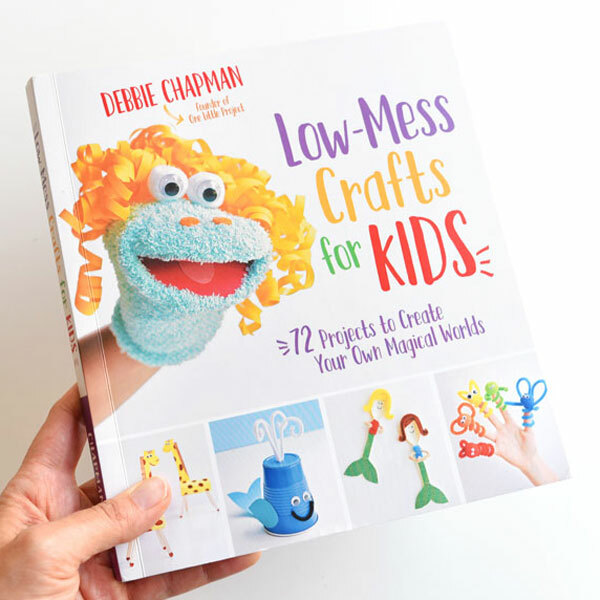 Check out our new book Low-Mess Crafts for Kids for 72 fun and simple craft ideas for kids!